Goodwin was honored during the 2019 Illinois Head Start Association Annual Conference from Wednesday-Friday, March 27-29 at the Bloomington-Normal Marriott Hotel and Conference Center. As a home visitor, she visits 12 students and their families in St. Clair County. She works with pregnant mothers and children up to age five. “I’m grateful for Mrs. Goodwin. She teaches Sk’i a lot,” said Darnellis Bennett, of Caseyville, during Goodwin’s recent visit with her and her three-year-old daughter. “She is patient and loving with Sk’i, and she makes me feel good about my role as a parent.” Bennett said she has ambitions of becoming a medical doctor. Goodwin has a business background. She received a bachelor’s in organizational management from Ashford University. Goodwin also has an associate’s in early childhood education from Southwestern Illinois College. She once worked as a bookkeeper and cashier. It was while working as a cashier in a café’ at Scott Air Force Base in St. Clair County that the idea of providing childcare was birthed in her. “I talked to my husband, and he said that the base had a class on home childcare,” she added. Goodwin operated a daycare out of her Belleville home for 12 years and then became an assistant director at a daycare center in Lebanon for five years. The SIUE Head Start/Early Head Start program serves more than 1,700 families and youth from birth to age five (including children with special needs) in St. Clair County. The program includes 14 early childhood centers, seven managed directly and seven collaborations. 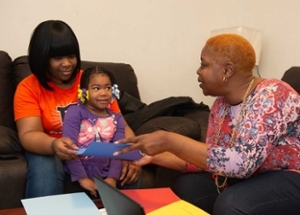 Services include a rigorous school readiness comprehensive program that includes educational programs for family members, and health and dental screenings. 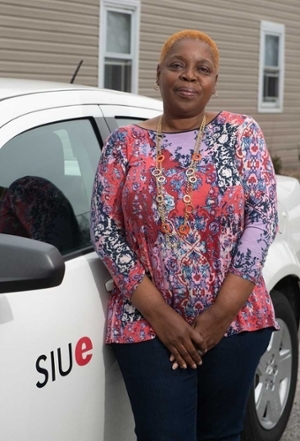 Sandra Goodwin, home visitor with SIUE Head Start/Early Head Start, is the 2019 Illinois Head Start Teacher of the Year. Goodwin explains a color exercise to Darnellis Bennett, of Caseyville, and her three-year-old daughter Sk’i.